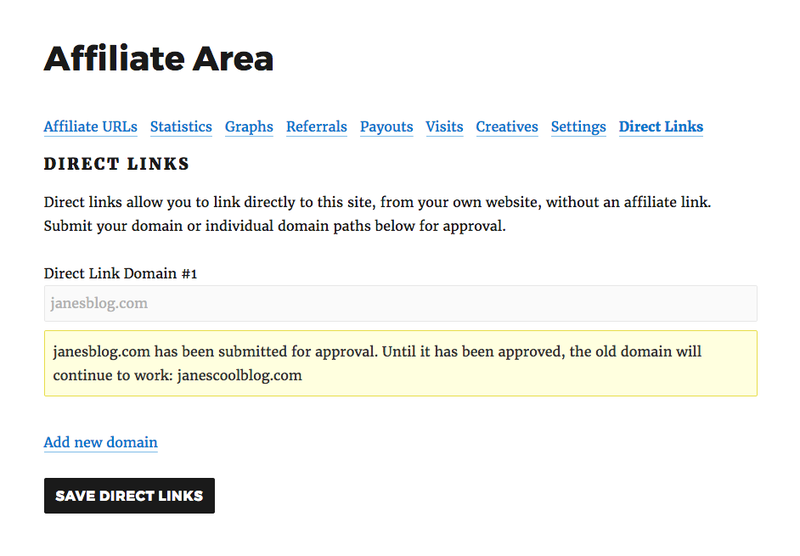 Affiliates can add one or more direct link domains from the Direct Links tab of the Affiliate Area. The number of domains an affiliate can add is determined by the site admin. To add a new domain after the next, the affiliate can click the Add new domain link. 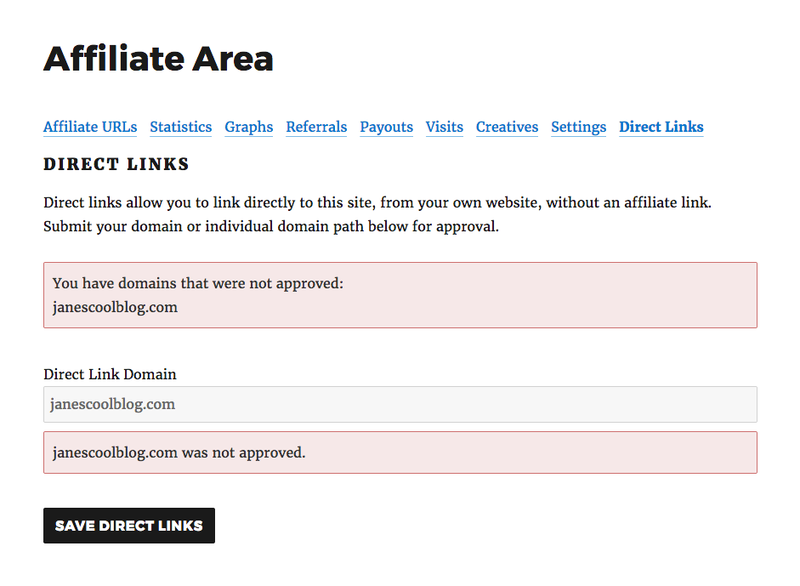 Once an affiliate's domain limit is reached, the Add new domain link will disappear. An affiliate can delete a domain by clicking the remove link next to the domain they'd like to remove. Alternatively, an affiliate can clear out the domain's input field and click the Save Direct Links button. 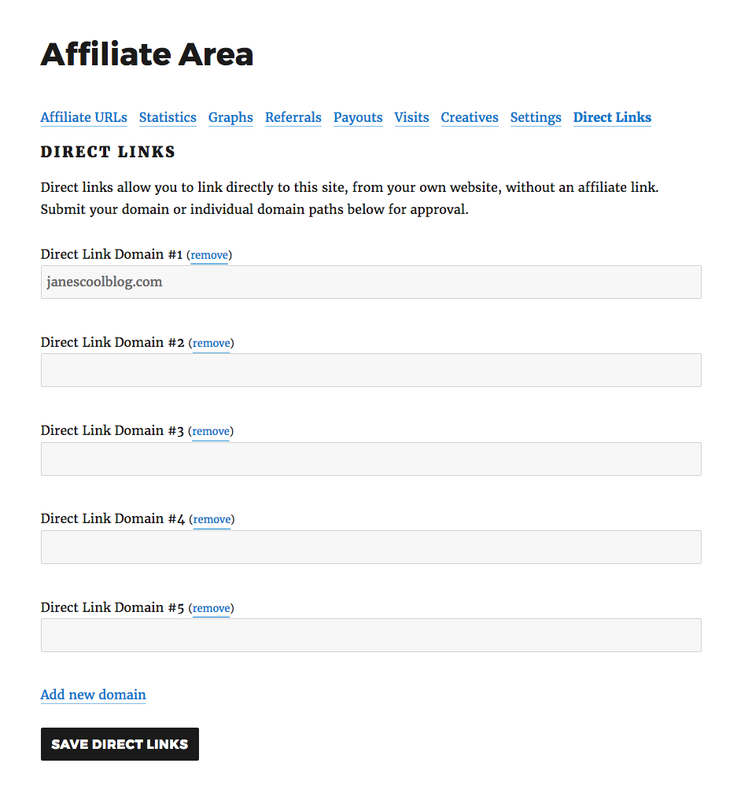 An affiliate can update an already approved direct link by changing the domain and then clicking the Save Direct Links button. Once the affiliate has made changes to the domain and clicks Save Direct Links, the admin will be required to approve it. The affiliate will be shown a message they can still use their old domain while their new one is being reviewed. 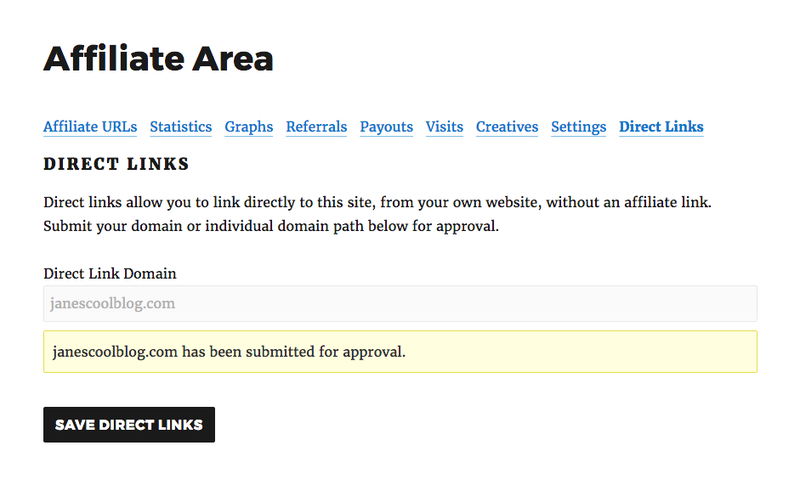 If an affiliate’s direct link domain is rejected, a notice will be shown at the top of the Direct Links tab, informing them of rejected domains. An additional notice is shown underneath each domain’s input field. The affiliate can choose to either remove the domain, or update the domain. Once the domain has been updated and the direct links have been saved, the domain will be set to pending for approval by the site admin. Note, if an affiliate previously had an approved domain, updates it to another domain, and the admin rejects it, a different notice will be shown. This notice will let the affiliate know that their previously approved domain will continue to work and they are able to dismiss the notice.